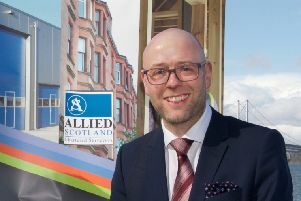 The Inverness-based group said the economic growth being seen in its home city – one of the fastest expanding in the UK – helped turnover rise by 15 per cent to £49.9 million in the year to 30 June. Pre-tax profits came in at just under £12m, an increase of 55.8 per cent, although much of the rise was down to £3.5m of one-off items including the sale of a commercial site together with a pension refund. The group, which is focused on Inverness but has interests across Scotland, currently has 1,237 units with planning consent, up from 1,106 last year. Chief executive George Fraser described the financial figures as an “exceptional result”. “The strong financial performance of the business over the last number of years is as a result of a clear strategy divesting of non-core assets and focusing on housebuilding,” he said. Fraser said with future developments such as the dualling of the A9 from Perth and the A96 from Aberdeen in the pipeline, the growth of Inverness is likely to continue and the company was looking for more sites to add to its landbank. Outside of its core area, it also recently announced the acquisition of its most southerly site in Scotland at Fenwick, East Ayrshire and started work at a site at Balgeddie Park, Glenrothes. The company directly employs 150 people, mainly in the Highlands, and supports a further 600 jobs at sub-contractors. Tulloch said it expects the housing market to remain “relatively stable” throughout the year ahead with similar volumes of properties sold although it added with “continuing uncertainty around Brexit a stable housing market in the short term is not a given”. At the end of June 2018, the group had net assets of £51.7m, an increase of 28.2 per cent. The highest-paid director at the group, which was founded more than 90 years ago, received a total pay package of £455,000, unchanged from the previous year. Fellow North-east based housebuilder Springfield Homes recently reported a sharp rise in half-year sales and profits and flagged further growth saying the drivers underpinning the market showed no “sign of abating”. The Elgin and Larbert-based group, which floated on the stock market in October 2017, hailed the benefits of its acquisition of Glasgow-based Dawn Homes, which allowed it to expand into the west of Scotland. First-half results revealed a 38 per cent hike in revenue to £75.7m with adjusted profit before tax nearly doubling to £6.1m.